Trust me, there are things in which I don't want to be the first to try something new. I'd prefer someone else to be the first on a new rollercoaster. I'd also like to wait a little while and hear feedback on the new restaurant that opened up in town. I'd even wait on the newest tech gadget to be released in order for the bugs to get worked out. But, after a while, I do like to dive in to things that I know can make my life easier or filled with more enjoyment. More than one year ago, I remember just beginning my digital voyage in tech tools to learn from others. In talking with others and lurking on various social media sites, I slowly got used to tech tools to enhance my learning, such as Twitter, Voxer, and Periscope. I even began using more digital tools in my daily work with staff members and parents, such as my website, Google Apps, the creation of a weekly "Friday Focus" to principals, and even using Facebook and Instagram (@guptank25) to showcase our schools and students. I distinctively remember times last year, when administrators, from all levels and years of experience, complimented me or thanked me for my work in social media to promote leadership but told me they weren't "quite there yet". Back then, I would give them a word of encouragement and invite them with support in whatever way I could. It's been a year now, and when I meet the same principal leaders, they have the same response: a compliment and the phrase, "I'm not quite there yet". After a year of learning with other educational leaders from around the world, my patience isn't like what it was. It's not out of frustration in wanting others to simply jump on the bandwagon for the sake of it; it's out of a sheer desire for others to experience the incredible shifts I've experienced in my own thinking and learning from innovative thinkers. Social Media Helps to Me Share Our Story. After finding out that our parents and students use social media tools, like Facebook, Instagram, and Twitter, I am amazed at how much benefit comes in posting a picture of a great lesson or showcasing our talented students. As a new leader to a district this year, it has helped me to connect with others in the community through a social media presence. I regularly receive positive feedback from parents and community members about their appreciation for knowing about the great things happening in their schools. I also have developed deeper relationships with staff members and students appreciating me being there (even if they didn't physically see me) and taking the time to share their hard work. Social Media Amplifies Conferences. Before moving in to the social environment, conferences were a place to gather with others in the same line of work and listen to a speaker. I may have know a few people and exchanged pleasantries with a business card with an empty promise to follow up in the future. Now, conferences have become a place to meet people I've exchanged ideas and thoughts through social media. I'm able to dig deeper at the conference by exchanging ideas from the presenter or topic, or collaborating on other challenges in the district just by having a pre-existing relationship with other leaders prior to coming. 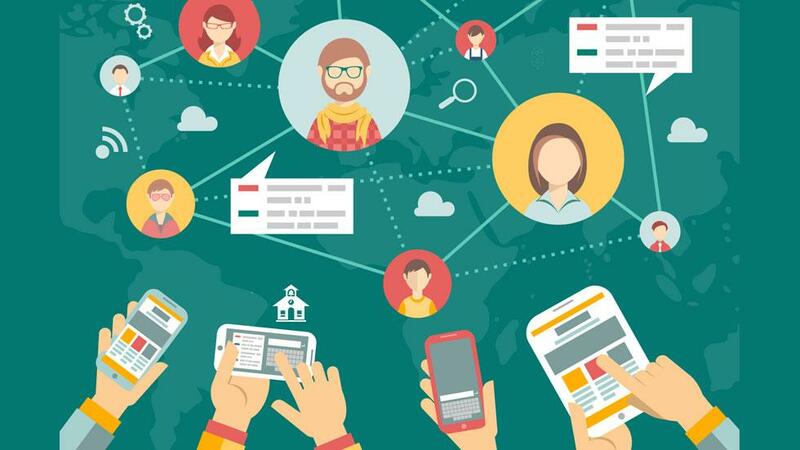 Social Media Fosters Connections. Through Twitter, I started slow. I connected with a few people I knew and just watched - we call that "lurking", and it's okay. Through my observations, I came across blog posts from other educational leaders. These posts helped me to stretch my thinking, affirm some ideas, and delve in to areas I had not considered. Although, I have never met them, I am constantly challenged by Jennifer Hogan, Jon Harper, and LeadUpNow. Then, I came across edchats. They are weekly forums on various topics at different times throughout the week. You don't need to be invited or register, you just show up, At first, I lurked, and then I jumped in. There are always new people trying it out for the first time, and the time goes fast. I invite you to check out #ohedchat on Wednesdays at 9:00 PM EST and #leadupchat at 9:30 AM EST. After awhile, I found another app called, Voxer. This app helps me to dig deeper with colleagues across the nation. We share book ideas, innovative things happening in our schools, struggles in leadership, and a word of encouragement when needed. Over time, groups connect - it's been fun to see pictures of celebrations from ideas that have become reality and even family events because we've gotten so close! In this forum, I am able to ask safe questions about curriculum, instruction, or assessment issues. Recently, I connected with Summer Howarth, Elisabeth Bostwick, Amy Heavin, and Ryan Jackson on the connect of Makerspaces. Their ideas and insights helped me to write a grant to bring it our schools. Without their diverse thinking and experiences, I would not have written to a depth of diverse thoughts and ideas. As I speak with leaders asking questions about going to the next level to help their schools, the conversations tend to go to social media. In this busy era of education, finding time to connect is difficult. But, using technology has been a key in accelerating and amplifying my depth to best help my staff, students, and community. I hope you'll take the time to reflect on your current journey, and ask yourself the question, "Why Are You Holding Out?"